Boris Fyodorovich Godunov (/ˈɡɒdənˌɔːf, ˈɡʊd-/; Russian: Бори́с Фёдорович Годуно́в, IPA: [bɐˈrʲis ɡədʊˈnof]; c. 1551 – 23 April [O.S. 13 April] 1605) ruled the Tsardom of Russia as de facto regent from c. 1585 to 1598 and then as the first non-Rurikid tsar from 1598 to 1605. The end of his reign saw Russia descend into the Time of Troubles. Godunov's career began at the court of Ivan the Terrible. He is mentioned in 1570 for taking part in the Serpeisk campaign being an archer of the guard. The following year, he became an oprichnik – a member of Ivan's personal guard and secret police. In 1570/1571, Godunov strengthened his position at court by his marriage to Maria Grigorievna Skuratova-Belskaya, the daughter of oprichniks' head Malyuta Skuratov-Belskiy. In 1580, the Tsar chose Irina Godunova, or Irina (later Alexandra) Feodorovna Godunova (1557 – 26 October/23 November 1603), the sister of Godunov, to be the wife of his second son and eventual heir, the fourteen-year-old Feodor Ivanovich (1557–1598). On this occasion, Godunov was promoted to the rank of Boyar. On 15 November 1581, he was present at the scene of the Tsar's murder of his own eldest son, the crown prince Ivan. Godunov tried to intervene, but received blows from the Tsar's sceptre. The elder Ivan immediately repented and Godunov rushed to get help for the Tsarevich, who died four days later. Three years later, on his deathbed, Ivan IV appointed a council consisting of Godunov, Feodor Nikitich Romanov, Vasili Shuiski and others, to guide his son and successor of Russia Feodor I, who was feeble both in mind and body: "he took refuge from the dangers of the palace in devotion to religion; and though his people called him a saint, they recognized that he lacked the iron to govern men." Upon his death, Ivan also left the three-year-old Dmitry Ivanovich (1581–1591), from his seventh and last marriage. Since the Orthodox Church recognized legitimate only his first three marriages, and any offspring thereof, Dmitri (and his mother's family) technically had no claim to the throne. Still, taking no chances, shortly after Ivan's death the Council had both Dmitri and his mother Maria Nagaya moved to Uglich, some 120 miles north of Moscow. It was there in 1591 that Dmitri died at the age of ten. His policy was generally pacific and always prudent. In 1595, he recovered from Sweden some towns lost during the former reign. Five years previously he had defeated a Tatar raid upon Moscow, for which he received the title of Konyushy, an obsolete dignity even higher than that of Boyar. He supported an anti-Turkish faction in the Crimea and gave the emperor subsidies in his war against the sultan. On the death of the childless Feodor on 7 January 1598, self-preservation as much as ambition led Boris to seize the throne. Had he not done so, the mildest treatment he could have hoped for would have been lifelong seclusion in a monastery. His election was proposed by Patriarch Job of Moscow, who believed that Boris was the one man capable of coping with the difficulties of the situation. Boris, however, would accept the throne only from the Zemsky Sobor, or national assembly, which met on 17 February and unanimously elected him on 21 February. 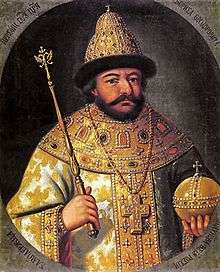 On 1 September, he was solemnly crowned tsar. During the first years of his reign, he was both popular and prosperous, and ruled well. He recognized the need for Russia to catch up with the intellectual progress of the West and did his best to bring about educational and social reforms. He was the first tsar to import foreign teachers on a large scale, the first to send young Russians abroad to be educated, and the first to allow Lutheran churches to be built in Russia. After the Russo–Swedish War (1590–1595), he felt the necessity of access to the Baltic Sea and attempted to obtain Livonia by diplomatic means. He cultivated friendly relations with the Scandinavians and hoped to take a bride from a foreign royal house, thereby increasing the dignity of his own dynasty. However he declined the personal union proposed to him in 1600 by the diplomatic mission led by Lew Sapieha from the Polish-Lithuanian Commonwealth. Boris died after a lengthy illness and a stroke on 13/23 April 1605. He left one son, Feodor II, who succeeded him and ruled for only a few months, until he and Boris' widow were murdered by the enemies of the Godunovs in Moscow on 10/20 June 1605. Boris's first son, Ivan, was born in 1587 and died in 1588. His daughter, Xenia, was born in 1582. She was engaged to Johann of Schleswig-Holstein, but he died shortly before their planned wedding in October 1602. Xenia was given the name "Olga" upon being forced to take monastic vows at the Voskesesnskij Monastery in Beloozero and her name is inscribed as "the Nun Olga Borisovna" at the crypt of the Godunovs at the Trinity Lavra of St. Sergius where she lived from 1606, when she sojourned there to attend the reburial of her father, until her death in 1622. 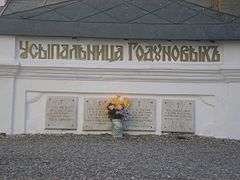 Boris, his wife, and their children are buried together in a mausoleum near the entrance of the Assumption Cathedral at Trinity-St. Sergius Lavra. ↑ "Godunov". Random House Webster's Unabridged Dictionary. ↑ Troyat, Henri (1993). Ivan le terrible. Flammarion. p. 284. ISBN 2-08-064473-4. 1 2 Durant, Will (1961). "The Story of Civilization". VII—"The Age of Reason Begins". Simon & Schuster: 513. ↑ Pushkareva, Natalia (1997). Women in Russian History: From the Tenth to the Twentieth Century (New Russian History). M. E. Sharpe, Inc. p. 319. ISBN 1-56324-798-4.